To draw attention to a specific part of the spreadsheet, you can insert a text box (a rectangular frame that allows to enter text within it) or a Text Art object (a text box with a predefined font style and color that allows to apply some text effects). to add a text box, click the Text Box icon at the top toolbar, then click where you want to insert the text box, hold the mouse button and drag the text box border to specify its size. When you release the mouse button, the insertion point will appear in the added text box, allowing you to enter your text. Note: it's also possible to insert a text box by clicking the Shape icon at the top toolbar and selecting the shape from the Basic Shapes group. to add a Text Art object, click the Text Art icon at the top toolbar, then click on the desired style template – the Text Art object will be added in the center of the worksheet. Select the default text within the text box with the mouse and replace it with your own text. click outside of the text object to apply the changes and return to the worksheet. As an inserted text object represents a rectangular frame with text in it (Text Art objects have invisible text box borders by default) and this frame is a common autoshape, you can change both the shape and text properties. To delete the added text object, click on the text box border and press the Delete key on the keyboard. The text within the text box will also be deleted. Select the text box clicking on its border to be able to change its properties. When the text box is selected, its borders are displayed as solid (not dashed) lines. to resize, move, rotate the text box use the special handles on the edges of the shape. 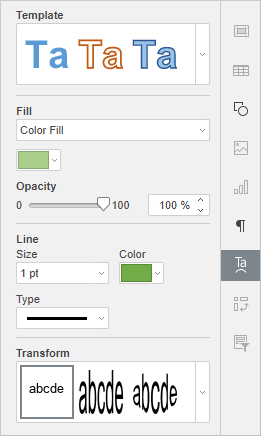 to edit the text box fill, stroke, replace the rectangular box with a different shape, or access the shape advanced settings, click the Shape settings icon on the right sidebar and use the corresponding options. to arrange text boxes as related to other objects, right-click on the text box border and use the contextual menu options. 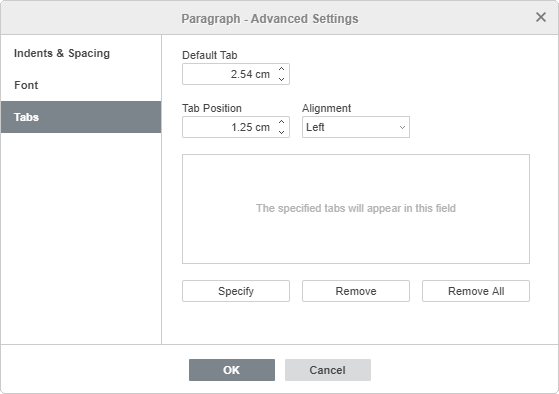 to create columns of text within the text box, right-click on the text box border, click the Shape Advanced Settings option and switch to the Columns tab in the Shape - Advanced Settings window. Click the text within the text box to be able to change its properties. When the text is selected, the text box borders are displayed as dashed lines. Note: it's also possible to change text formatting when the text box (not the text itself) is selected. In such a case, any changes will be applied to all the text within the text box. Some font formatting options (font type, size, color and decoration styles) can be applied to a previously selected portion of the text separately. Adjust font formatting settings (change the font type, size, color and apply decoration styles) using the corresponding icons situated at the Home tab of the top toolbar. Some additional font settings can be also altered at the Font tab of the paragraph properties window. To access it, right-click the text in the text box and select the Text Advanced Settings option. Align the text horizontally within the text box using the corresponding icons situated at the Home tab of the top toolbar. Align the text vertically within the text box using the corresponding icons situated at the Home tab of the top toolbar. You can also right-click the text, select the Vertical Alignment option and then choose one of the available options: Align Top, Align Center or Align Bottom. Rotate the text within the text box. To do that, right-click the text, select the Text Direction option and then choose one of the available options: Horizontal (is selected by default), Rotate at 90° (sets a vertical direction, from top to bottom) or Rotate at 270° (sets a vertical direction, from bottom to top). Create a bulleted or numbered list. 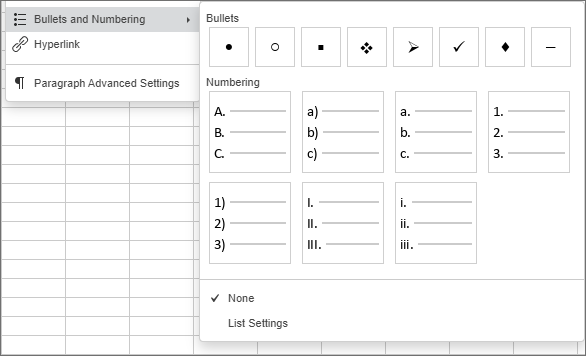 To do that, right-click the text, select the Bullets and Numbering option from the contextual menu and then choose one of the available bullet characters or numbering styles. 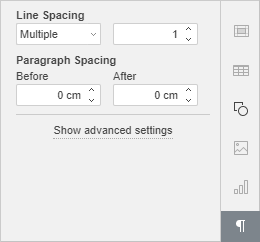 Set line and paragraph spacing for the multi-line text within the text box using the Text settings tab of the right sidebar that opens if you click the Text settings icon. 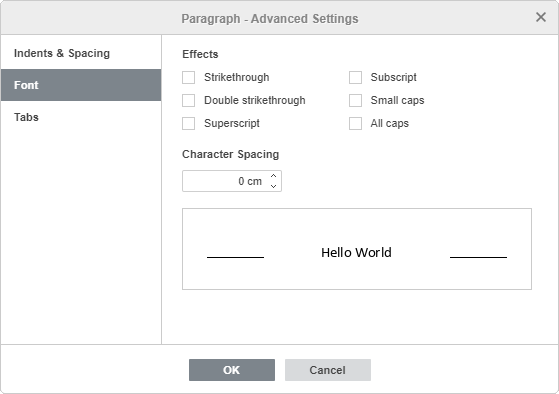 Here you can set the line height for the text lines within the paragraph as well as the margins between the current and the preceding or the subsequent paragraph. 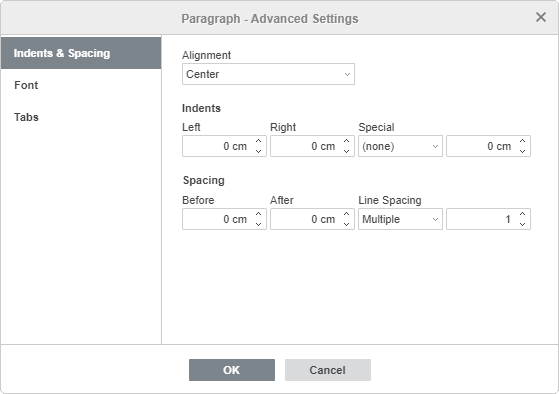 The Indents & Placement tab allows to change the first line offset from the left internal margin of the text box as well as the paragraph offset from the left and right internal margins of the text box. Character Spacing is used to set the space between the characters. The Tab tab allows to change tab stops i.e. the position the cursor advances to when you press the Tab key on the keyboard. Tab Position - is used to set custom tab stops. Enter the necessary value in this box, adjust it more precisely using the arrow buttons and click the Specify button. Your custom tab position will be added to the list in the field below. Default Tab is set at 1.25 cm. You can decrease or increase this value using the arrow buttons or enter the necessary one in the box. Alignment - is used to set the necessary alignment type for each of the tab positions in the list above. Select the necessary tab position in the list, choose the Left, Center or Right radiobutton and click the Specify button. Left - lines up your text by the left side at the tab stop position; the text moves to the right from the tab stop as you type. Center - centres the text at the tab stop position. Right - lines up your text by the right side at the tab stop position; the text moves to the left from the tab stop as you type. To delete tab stops from the list select a tab stop and click the Remove or Remove All button. Select a text object and click the Text Art settings icon on the right sidebar. Change the applied text style selecting a new Template from the gallery. You can also change the basic style additionally by selecting a different font type, size etc. Change the font fill and stroke. The available options are the same as the ones for autoshapes. Apply a text effect by selecting the necessary text transformation type from the Transform gallery. You can adjust the degree of the text distortion by dragging the pink diamond-shaped handle.